I drew it with a black prisma brush marker and a sharpie. 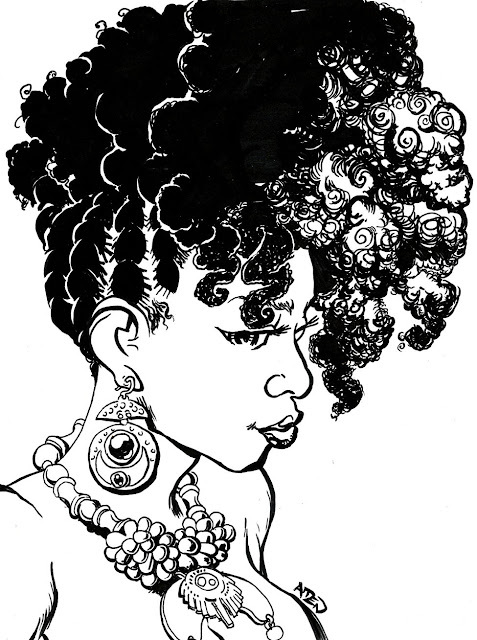 For those who don't know, this is a portrait of award-winning jewelry artist, and b-girl extraordinaire Camisha Jackson. The necklace she's wearing here is one she made herself, so respect the skills! CLICK HERE to have a picture of yourself, a friend, or your favorite fictional or historical character turned into a cool cartoon drawing! Perfect for social media profile pics, avatars, and covers. Cartoon Portrait- "Cocoa and Mom"